Chalet Brenettes is a faultlessly designed eight bed chalet positioned in a quiet area at the entrance of Meribel. Spacious and open-plan, Chalet Brenettes offers two living areas, one of which is perfect as a separate TV room. A preferred chalet for many of our returning guests, Chalet Brenettes has space, comfort and Alpine style in abundance. The huge south-facing terrace makes the most of the sunny weather, and is an excellent place to watch the sun set behind Meribel's snowy peaks. Chalet Brenettes was designed specifically with chalet holidays in mind, and as such boasts equally sized rooms, each with en-suite and flat screen television. A warm and homely chalet, Chalet Brenettes is perfect for relaxing after a day on the slopes, spending time with family or friends around the log fire, with cups of tea and slabs of cake. Spectacular mountain views, an indoor/outdoor hot tub, eucalyptus steam room and massage area make this, hands down the best place to switch off and take a little time out after a physical day on the slopes. 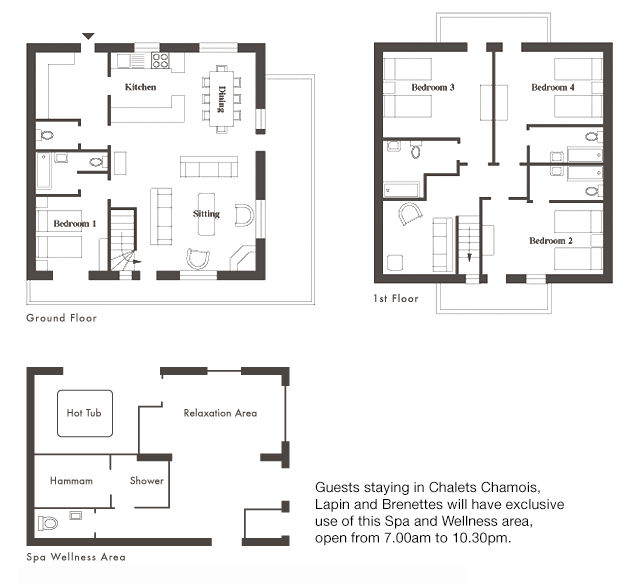 Guests staying in Chalets Chamois, Lapin and Brenettes will have exclusive use of this Spa and Wellness area, open from 7.00am to 10.30pm. Sophie was a dream. Helpful, friendly, meticulous and a cracking cook. I wanted to bring her home with me! Please could you pass on my grateful thanks for making it a truly memorable holiday. Our host was excellent throughout the week. Food was fantastic and well presented. She adapted the menu upon request. The chalet was kept clean and tidy and she made us feel really welcome. We couldn't have wished for a better host. She was brilliant! Chalet was amazing! From the cleanliness of the rooms to our hosts the whole feel of the chalet was 5*. As a tall person ski chalets can be a bit of an obstacle course, but the chalet itself was of great size and very well equipt for all of our needs. Due to the name of the company we were expecting a good service, but all expectations were surpassed. We were not expecting our rooms to be maintained whilst we were there, or daily cleaning of all facilities, but the fact this did happen was outstanding and really impressed the whole group by the quality of the Chalet and service. Thank you a wonderful holiday, it was a great experience staying at chalet Brenettes and thanks to Sophie and mike our chalet staff, we had a blast. Thank you again and maybe see you next year again! I cannot fault the service of Ski Basic and I cannot believe that for the second year running we have had the most amazing Chalet hosts. The food was amazing; they were really friendly and couldn't help us enough with all aspects of our ski holiday even offering to help us on their days off. Gold star to you as a company for finding such wonderful people and please praise Sam & Phoebe for making our holiday so great. I will recommend your company to anyone I know that is looking for a ski holiday. Thoroughly enjoyable- beautiful chalet, friendly staff across the board and loved how we felt at home whilst being treated like very important guests! Will be recommending to others in a heartbeat! Thank you! Brilliant holiday and very keen to come back next year with Ski Basics. A really positive, professional service with a great chalet, hosts and management. Top notch. Sophie and George provided an excellent service throughout the week. Super efficient and friendly, all meals were on time and delicious, and great cakes! Every box is ticked in this chalet – this is our third year and we always notice the changes and upgrades which have been made between each winter. The chalet was better than we expected. The photographs on the internet do not do it justice. Great sized bedrooms and en-suites. Fabulous living area with enough seating for eight people. Phoebe and Sam were the perfect hosts, a pleasure to be around! The food was delicious, the chalet immaculate, very impressed. Phoebe, Sam and Emily were incredible. We had unbelievable meals, great guidance on the areas for skiing, nightlife, and entertainment. They were always courteous, thoughtful and focused on our satisfaction with the trip. I would highly recommend them and Ski Basics to all friends / colleagues looking for a winter holiday location. They were all-stars in every sense of the word. As an example, one of the guys in our group had a birthday while we were there - the team got candles for the afternoon cake along with balloons!! What a thoughtful thing to do. Beautiful chalet in wonderful surroundings. Chalet kept immaculate. Our chalet was beautiful. It was comfortable, warm and clean. The chalet hosts were lovely people who went over and above their call of duty. Any query was answered efficiently. Their attention to detail was superb. We had two young children with us and Phoebe and Sam were so good with them and helped ensure they had everything they need and that they liked their menu. We really enjoyed our chalet experience. Thank you Sam and Phoebe.